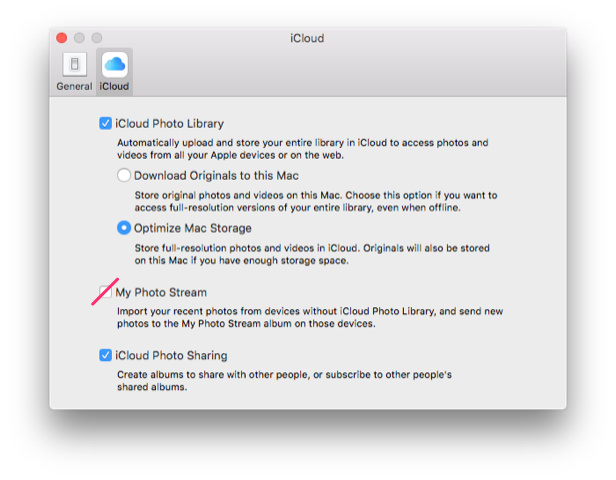 Like skimpy iPhone and iPad flash storage,** solid state storage on your MacBook Air may not accommodate the decades of photos syncing with your macOS Photos Library. Since iCloud is already storing full resolution originals of your photos, you don’t need to fill up your MacBook Air storing them again. What can you do? The Optimize Mac Storage setting may leave you with mostly low resolution images while working offline. They look OK onscreen and as small prints, but your project may require the full resolution original. BTW: Photo Stream is old-school. Leave it unchecked. If needed, open and refresh high resolution originals that you’ll use, then go offline. Alternately, work offline with low resolution images, then reconnect later to download full resolution originals. A big USB flash drive or external USB hard drive are great ways to keep high resolution originals close at hand while working offline without filling up your MacBook Air's sparce flash storage. How do you export your high resolution photos to offline storage? Check out Photos Help. Since you’re on a roll, free up more storage on your Mac, mobile devices, and on iCloud by removing shared albums.S Then uncheck iCloud Photo Sharing. Bonus tip: Keep it going by subscribing to Apple’s iTunes Match service. Like iCloud photo sync and storage does, iTunes Match stores your music (yes, even Woolie Bully) in the cloud and streams your singles, albums, and playlists to your iMac, MacBook, AppleTV, HomePod speakers, Sonos speakers, iPhone and iPad. Works great, even over cellular broadband. iTunes Match costs $25 per year, and it is separate from your iCloud storage and sync plan.